The plan was coming together in early 2018. A friend and I were talking of taking on the Hardmoors Marathon series in 2019 after several 10k and half marathon races in 2017 and 2018. The aims of increasing the distance, the elevation, the number of events over a 12-month period were all challenges we believed we were up for….and as part of the training in advance of the first ‘Chapter’ of the Hardmoors series we thought it would be good to take on the New Years Day Hardmoors 15. 15 I hear you say, but the title says 30…. there must be a mistake, a typo in the report which needs correcting…..alas no. The only error occurred by me failing to log on in time to secure a spot in the 15 being forced to sign up for the 30. The cursor hovering over the payment button longer than usual given this was on New Year Day…..however it was not enough to deter me, we pressed proceed and we were in, booked up for 30 Hardmoors miles. Generally having a good weekly mileage behind me I was confident I could manage the distance but with little hill work other than races in December I went into Christmas wanting to know what I was getting into. A recci of the route a week before helped me understand the areas I thought I could gain time against the ‘mountain goats’ in the race and have a better understanding of the terrain and stages of the race. An early morning start as usual for the race with the long drive to Robin Hoods Bay for the 9:30 klaxon. As usual the registration area was already busy, seeing some familiar faces and already feeling the warmth and positivity which these races and the runners seem to have in bucket loads. I collected my number, passed the mandatory kit check (and was asked if I was running with my travelling back pack…scary), packed up the hydration vest and started to go for the warmup and congregation on the starting line. As the competitors gathered on the starting line around me I often reflect on the why, the what and on the where did all this seem normal. 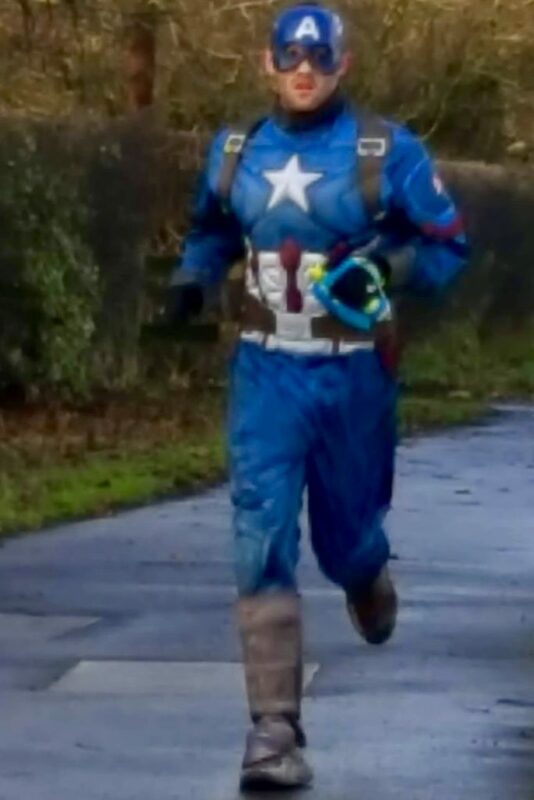 A near 40 year old man, wearing compression tights, a race vest, hydration pack and even packing walking poles and a compass…. On New Years Day in 2000 if I could have saw into the future of 2019 I would have reached for another beer to take the image from my mind. I knew the route, I had completed the research, first 6-7 miles was along a cinder track to Whitby, through the town and up the steps to the abbey. I new this would be a good stretch for me, solid footing, slight incline but steady pace would have me in a good position I hoped a quarter of the way into the race. As the race started there were 4-5 of us in a pack for the first mile…. steady pace until the lead runner picked up the pace and started to kick out 6:30 min/miles towards Whitby. I responded by increasing slightly but knowing we had 27+ miles to go wasn’t interested in a foot race this early on in proceedings and stuck to a slightly revised version of my plan. After the climbing of the steps I had opened up a gap behind me to the third placed runner but had no sight of the leader. Thinking he had kept his pace going I kept the best rhythm possible on the contours of the Cleveland Way on the route back to Robin Hoods Bay for the half way check point. The ground and weather to us were kind in equal measure as we ran along the cliff tops, the ground hardened since the previous weeks recci which I was extremely glad of which allowed me to make good time over the first 13 miles. Back into Robin Hoods Bay check point at mile 13/14, shouted out my number, gave a wave to the marshal, grabbed a handful of jelly babies and off I went. Next stop Ravenscar and Hayburn Wyke for the third quarter of the route. 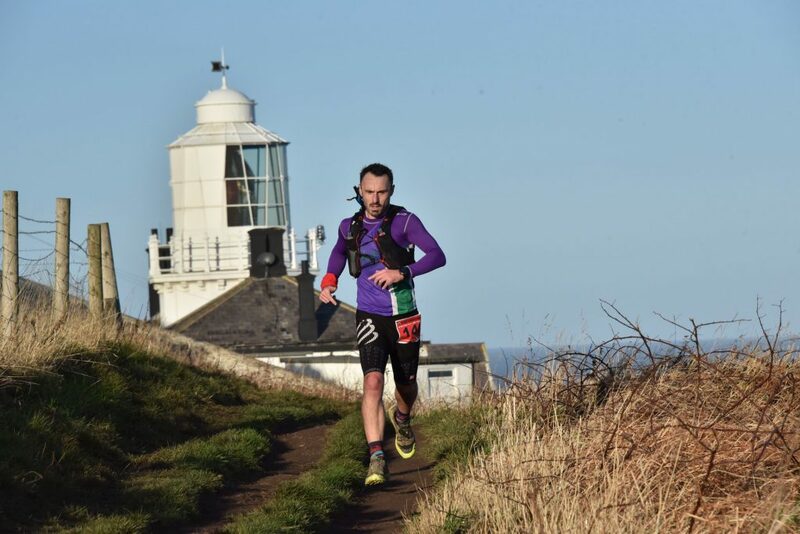 Again I knew this was back on the cinder track, firm footing but a steady climb to Ravenscar before flattening to Hayburn, chance to push on to see if I could see the leader…..all to no avail but knowing I had tried left me confident I shouldn’t have lost time on third place. Here I filled up my water for the first time since the start before the last push back along the coast and the Cleveland Way to Robin Hoods Bay. Taking on more fuel I prepared for the technical part of the race, a series of climbs and descents from cliff top to bay, down stone steps, boggle holes and the like as we raced back to Robin Hoods Bay; wind in our faces as we made our way over the cliff tops and through the tree lined trail. Running down through the steep descent through Ravenscar to the Alum works, remembering this on the recci and the route to go through the works on the Cleveland Way through to Robin Hoods Bay…. or was it straight past the Alum works? I kept going knowing it shouldn’t be that much of a detour, only to come out and turn around and see third place behind me…. from nowhere. Immediately the pace picked up as I passed multiple tourists walking along the coast for a New Year’s Day stroll, a million ‘excuse me’s’, ‘runner coming through’ and ‘sorry’s’ later I was down at the base of Robin Hoods, no sign of third place…..on reflection given how bad I thought I would smell after the best part of four hours running you would think they would move quicker out of my way. Ill forgive them though due to the breeze and the fresh sea air combined with the previous nights copious amounts of alcohol. One last push I knew, a sting in the tail, a steep climb on tarmac from the bay to Flyingdales community centre. A push and drive of the legs up to the crest and a turn back to see no one behind me…a chance to relax, gather and refresh the legs before the climbs levelled off allowing a few minutes to find rhythm before the finish line and put on a brave face….. and finally seeing the first placed runner again. 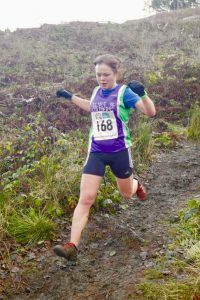 The clue is invariably in the race series title that these will be Hard but the spirit of the organisers, competitors, marshals and supporting families make these fantastic races and extremely popular for all ages and abilities and something I would recommend to anyone. Overall a great race, great day and great way to start 2019. 4 hours of running, over 2000 foot of climb in a beautiful part of Northern England….and happy to come away with second place. p.s. 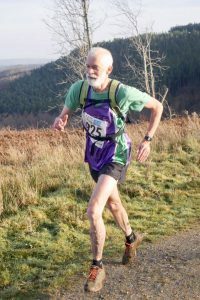 it was also great to see Dave Toth picking up his 1000 Hardmoors Mile in the 15 event…impressive if punishing running! The warmth of the village hall was soon forgotten as I headed out the door and into the morning darkness for the start of the Tour de Helvellyn. The weather forecast had been the subject of much debate the previous day on Facebook between the small group of Striders that were due to take part in the race.
. The weather forecast had been the subject of much debate the previous day on Facebook between the small group of Striders that were due to take part in the race. With Storm Deirdre bringing winds in excess of 60 miles per hour and wind chill down to around minus 10 degrees, the day was certainly looking to be a challenging adventure. Thrown into the mix were freezing rain, a rare occurrence in the UK, and snow for later in the day to further add to the hazards we’d face. The weather brought the dilemma of what kit to start the race in and what to carry in addition. I opted to start out light and add layers as the day went on meaning I’d be carrying a fairly heavy pack. I arrived at Askham Village hall in good time to register and prepare ahead of the race which I’d decided to start at around 7:30 am. Getting out of the car it was immediate how cold it was going to be and headed straight to the hall to register. Upon entering I happened to notice a small handwritten note which read that the route was to be shortened by around 12 miles, cutting out the loop around Helvellyn due to the weather. At registration, this was confirmed and although I was slightly disappointed, I was relieved that I wouldn’t be out in the mountains for as long as I’d thought. This also meant I could ditch a small amount of the extra kit I was carrying and lighten up my pack a little. As I did so, Elaine, Geoff and Juliet turned up to register. Out on the open moor, it was starting to get light as I moved at a steady pace having set off at 7:45 am. The wind was blowing but nowhere near as strong as expected and, despite the initial shock of the cold, I was happy with the number of layers I had on. The first few miles cross Askham Moor are pretty straightforward to navigate. I ran with a girl from Penrith and we chatted as we steadily made our way towards Howtown. The ground was quite hard underfoot and there was the odd patch of ice but nothing too treacherous. At Howtown there’s a choice of routes you can take to get to the first checkpoint at Martindale Church – either continue straight across the trail and arrive at the back of the church, or cut down past the adventure centre and run up the road to the church. It’s noted that the road is the quicker of the two and is the route I took on my previous running of this race. Today, opted for the trail. Checking in at Martindale Church, I moved swiftly through to the next section which is a long road run up the valley to the start of Boredale Hause. From here the route climbs to the col which then leads to the village of Patterdale on the other side. The next checkpoint is at Side Farm at the foot of the pass on the edge of Patterdale but you cannot pass through until this opens at 9:30 am so timing your run is vital. This meant that there were a lot of runners on this section as I arrived just after the opening of the checkpoint. Inside I grabbed a few treats then made off for the next section through Glenridding and up towards our turn around point at Swart Beck Footbridge, just below Sticks Pass. The weather was still ok on this side of the valley but the howl of the wind could be heard and every now and again there’d be a strong gust that would take you by surprise. Still taking my time, I ran into Glenridding and up past the Traveller Rest pub to the Greenside for the start of the steep climb up to Swart Beck. The route climbs steeply here, often the need to use all fours to make progress. It was getting colder and the wind was stronger as I made my way up. For the very short moment I dared lift my head I spotted Elaine making light work of the descent having already been to the checkpoint and turnaround point. The girl is a machine and had passed me somewhere on the route as I knew she’d started after me. I eventually got to the point where that path levelled off and made my way across to the checkpoint before turning around and making my way back. On the way back I passed Geoff who has been running immensely strong this year and again, I knew had started after me so was making good time. It was now a battle to try and stay ahead of him. The run back off was taken with caution as the ground was covered in loose rocks. I slipped and pulled a muscle in my left shoulder, nothing serious but was quite painful at the time. Retracing my steps back through Glenridding to Side Farm, I enjoyed the run in the shelter of the valley. I checked in at Side Farm and took a moment to grab a nice hot cup of tea and a biscuit. Rather than wasting time, I set off with my tea (you have to bring your own mug if you want a drink), as I left Geoff came running in, he was closing the gap on me. I made my way up the steep climb back up to Boredale with my tea which seemed to be retaining its heat a bit too well. The climb was slow and laborious but eventually, I reached the top, stashed my now empty cup and made for the long descent back to Martindale Church. At the foot of the pass, I went to open a farm gate but a gust of wind howled in and trapped me, I had to wait until it eased to get myself free. I ran/walked up the road eventually arriving back at the church. I checked in and decided to head back across the trail rather than take to road route through Howtown. The wind was picking up and my body temperature was dropping as was my pace. I was feeling really tired all of a sudden and running was becoming difficult. The ground was getting icier heading back to Askham and the tracks were becoming more hazardous. Hopping the tracks and ice was energy sapping and because of this I misjudged a jump and ended up flat on my back. I lay for a bit as I slowly tried to comprehend what I’d just done before trying to get up which was much more difficult than it should have been. It was now raining but it didn’t seem too heavy. This was freezing rain however and I was now soaked and very cold. With about a mile and a half to go, I decided to just keep moving and get back to the finish as quickly as possible. Eventually, I made it back and was so glad to be warm. Elaine was already relaxing and Geoff was back getting changed. He’d managed to pass my due to route choice at Martindale Church, I’d taken the high road, he’d taken the low. In all, I’d enjoyed this race but was pretty relieved that it had been shortened – even though it was still a 27-mile race. I made hard work of it as I seem to have with all my races in 2018 but it was a good experience again. The journey home was just as eventfully however as the A66 had been closed meaning a diversion up the M6 and across the A69 was needed to get home. I was huffing and puffing up a hill at the Gibside Fruit Bowl, in clear pain and feeling knackered, when a mate of mine who was marshalling shouted out “Get on with it!! Running’s easy. Remember its simply about putting one foot in front of the other’. If only life and running was that simple… and it’s not in my view of the world. This was brought home to me in the last couple of weeks when I’ve realised that running is definitely not so simple, both in its execution and in the use of all the paraphernalia, which is supposedly designed to make things easier. Firstly I will cover the gear supposedly designed to make things easier. In our house of two, we have about 600 pairs of running or outdoor sporting shoes. Ones for road running, ones for the gym, cross country, Outdoor trail shoes for actual trails, outdoor trail shoes for bombing about town, walking boots; and just in case of emergency old pairs of all the above which are kept in the garage. We have not had an emergency yet, but we still keep them. The point is that to meet our ever-changing running needs each one of these pairs of foot attire represents a greater cost and investment in cumulative design technology than our yearly national contribution to the EU. For instance, I’m in the market for a pair of new running shoes and I was reading a review in one of the running magazines about one of my preferences. The article had passages like this. “ A dual density EVA midsole with air units fore and aft provides stability, while a gel heel absorbs shock, but the shoe makes a narrow footprint, a characteristic that typically suits only the biomechanically efficient runner’. Crikey! I’m not sure if I’m a biometrically efficient runner, but I do know that Neil Armstrong was put on the moon with less science at his disposal. My reply of ‘ Only after 5 pints and a curry’ was not only flippant but also grossly unhelpful and outlined my total ignorance of the complexity of my running needs. What I should have understood was that the assistant was referring to the natural movement of the foot that occurs during foot landing while running or walking. That this action is composed of three cardinal plane components: subtalar eversion, ankle dorsiflexion, and forefoot abduction, these three distinct motions of the foot occur simultaneously during the pronation phase. As you can see, it’s dead simple when you are in the know!! The reality is that the choice of running shoes is seemingly limitless, all scrupulously engineered and biometrically designed to suit all shapes and sizes of runners. Therefore you need the guidance of a shoe guru to keep you right in your purchases, and in my case to keep things simple. The second aid to simplicity is technology designed not to keep you informed about your training and running, often a great source of entertainment and commonly known as The Garmin, The Fit bit, or simply the running watch. Technology is great and I love my Garmin, but the hardest part was setting the damn thing up, synching it to my iPad, then linking the data to Strava, which apparently sends prompts to people to like my efforts and give me the thumbs up, or some other gesture as the case may be. When setting up my device I had to call the Garmin helpline, because I needed to feel totally incompetent by someone much younger than me. I was stumped by the first question. She needed the serial number. “Where is it?’ I asked. I was totally lost and quickly losing the will to live, and showing my complete ignorance of modern technology. Apparently, it was written on the back of the watch, but in letters and numbers so small that I needed a magnifying glass to read it. My serial number was something like RD1257c6522910976V. Why?….. Never mind….. Eventually, I got the watch up and running and have great fun with it. I just love the idea of lying perfectly still on the settee and not moving a muscle in order to get my heart rate as low as possible. Or running around a series of football pitches in a vain attempt to write my name using the GPS tracker and mapping function, or running around the village to make a GPS map of every street. It’s all great fun before you even start to try to analyse all the data that gets recorded. Apparently, I have a great VO2 Max and fall within the top 5% of people for my age group, but when it comes to my FTP (I haven’t a clue what it means) I have moved from Fair to Good with a reading of 2.82, and clearly could do better. You see, running is supposedly simple, buts its clearly not when it comes to technology. Neither is it in its execution in my view, as highlighted in my recent participation in Orienteering. 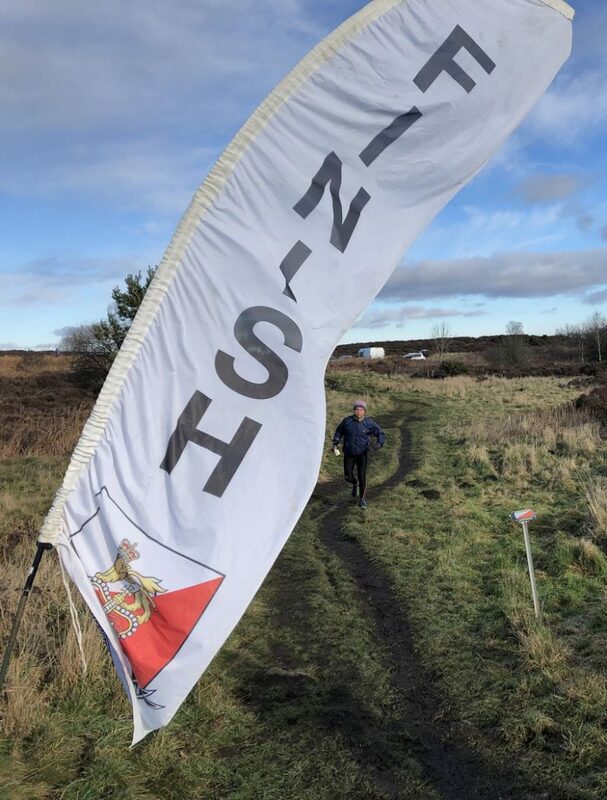 Now I’ve done a fair bit or Orienteering over the years, and during the Christmas break, I participated in 2 different events, neither of which proved to be simple. Firstly to set the scene, I think it’s important to acknowledge that some participants come from a different clan of the running fraternity to the most popular events I usually run in. This is highlighted on arrival at the car park and a look at the cars that regular participants have a preference for. Citroen Berlingo’s, Peugeot Partner’s and Fiat Doblo’s or similar cars of a practical nature and square design are very prevalent, often beige or grey in colour. Also, regulars run in a style of running kit that is practical for running in or through spikey bushes and dense undergrowth. 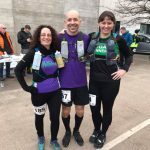 This encompasses a leg gaiter protector around the lower legs known as bramble bashers, and then loads of very durable running trousers and long sleeved running tops. This gear is not for the fashionistas, and comes usually in the most horrible colour combinations imaginable, and was designed primarily with the Victorian gentleman or lady explorer in mind. 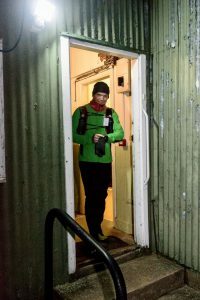 The basic principles of orienteering are that you have a map of the course, a compass, a topographical description of the numbered control points located on the map, and an electronic dibber to record your presence at each checkpoint. • Competitors visit as many controls as possible within a time limit. • There is usually a mass start (rather than staggered). • Controls may have different point values depending on the difficulty to locate. • T he competitor with the most points in the fastest time is the winner. 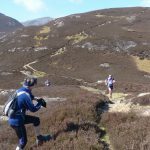 At each race venue, there will be routes of varying difficulty and length to choose from; therefore it’s a good way to lose the whole family if you so wish. You can do these events on your own, but also you can pair up with a friend or relative to make up a team. If you do these races with your wife, husband or partner, then be prepared to have a really good argument about half way round, usually about navigation and the best way to read a map, or whether to navigate by instinct or compass. You will just have to work out from experience what is the best way for you to compete in the least stressful way. It should be fairly straight forward to run this event. However, reading the maps takes some getting used to, both in terms of coming to terms with the scale where you may cover the ground quite quickly on the map, and then interpreting what you actually see for it to make sense. For example, the open ground is shaded on the map, whilst woodland is clear and unshaded. The next difficulty is that each control point is usually cunningly hidden on a topographical feature. Each map usually includes a table listing each control point together with a series of symbols to describe what that feature is and where on this feature the control is located, For example, separate symbols may show the control to be at a flight of steps, at the top, on the eastern side. The problem is that there are dozens of different symbols to learn and understand, including narrow marsh, a small depression, rentrant, pit, thicket etc. It all gets very complex if you allow it to get to you. My basic approach to this is to just make my way to the vicinity of where I think a control point is, and then run around like a headless chicken until I fall over it. Again it’s not simple, and this point is emphasised with some of the language used to describe some features. My favourite is a ‘linear thicket’. To most people, this is a hedge, as in ‘I’m going to cut the hedge as it needs trimming’. I certainly don’t say, ‘Today, I’m going to cut my linear thicket’. This was pretty straight forward for me, based on the fact I know the venue very well, I could read the map easily and basically knew all the paths and shortcuts without having to use the compass I did not take with me. Running on instinct rather than with a plan, the control points were located across the County Hall and Aykley Heads site, covering the ground across to the railway line. Taking a counter-clockwise route, I got to 31 control points out of 35. The only problem was that the proximity reader held on my finger failed to register 5 control points, meaning that there was no record of my visit to those points. 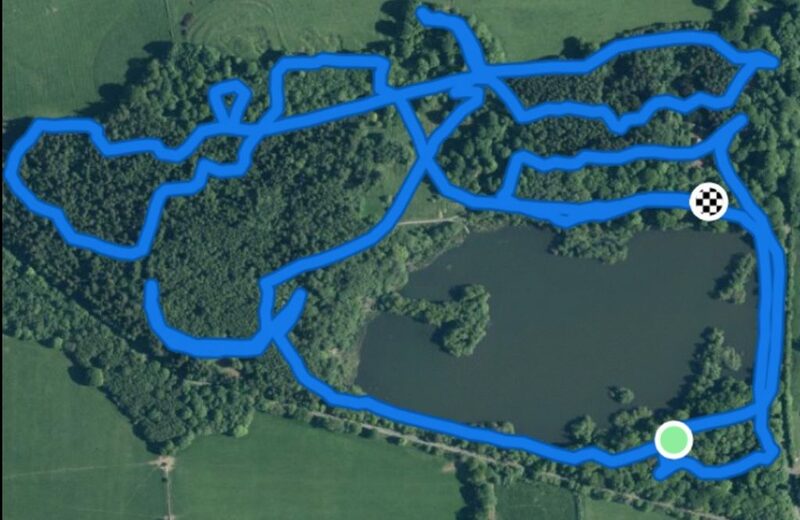 Thus, whilst this was a great run out, and the navigation was relatively straight forward to execute, modern technology failed me and made a simple task very hard. We do this every year and it is always a great one to do. The area covered is much smaller than Aykley Heads, but the terrain is much more difficult to navigate. Forget about linear thickets and open ground. Think of dense jungle and lost tribes. The control points are set in sequence across the park, with some points requiring a good long run to cross between, whilst others are much closer together, but well and truly hidden and requiring proper navigation to get to. Having done this event on many occasions, I know the ground and can read the map; so seeing where to go to get to each control point, in turn, is straight forward. The hard part is that some of the controls are placed in deep marshes in the middle of thick evergreen forest. The purists will dodge off on a compass bearing and measure out the distance to hit perfectly the control point. I will rely on counting out drainage ditches on the map, and then turn off paths to find the control in the forest. At Bolam Lake, I once come across some members of the infamous lost ‘Wherethehellarewe Tribe’, so you can understand how thick the vegetation is. The reality is this is no 7.30minute mile pace race. It’s more like wandering around in circles, jumping across ditches, falling into ditches, in search of control points, at 15-minute mile pace. This point is emphasised on my Garmin tracker, which records my taken route that seems to wonder like a lost spider across the screen. Its tough, and it can be dangerous, and as I tried to run through an evergreen tree to make it to a known path I virtually impaled my left hip on a broken low hanging branch. Completing a self assessment triage, I established that although I had drawn blood, I didn’t need an immediate medical rescue and evacuation by the Great North Air Ambulance Service, and so I was able to continue and make it to the end in a reasonable time placing me in the middle of the field (Note – not the middle of A FIELD, but THE FIELD, my navigation is not that bad). Finally, running, in theory, can be very simple and should be about putting one foot in front of the other. The reality is that equipment; technology and races such as orienteering events can be very complex and at times incomprehensible. However such complexity simply gives added value and infinite variety to the sport we love. 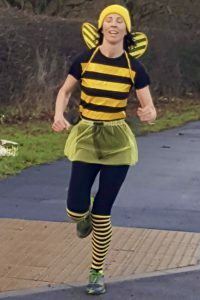 Reviewing my running in 2018 in November was, on the whole, a satisfactory experience: decent weekly mileage? Check, with only a few slack weeks due to injury or work. Getting some worthwhile XC and cat A/B fell races in? Check, with a handful I’d never done before slipped in. 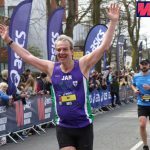 Knocking a bit of time off previous PBs on a couple of races? Check once more. The only real holes in what was otherwise a good year were the failure to get across to any of the Lakeland Classics and the 2x ultra, Did Not Starts, the former (Calderdale Hike) due to a bout of man-flu that hit me the evening before and saw me find out what a temperature of c40c feels like (not great, would not recommend), the latter (Bradwell) as a result of a shift over-running to the point that I’d not left work by the time my train pulled out of Central Station. As a consequence, whilst on a bit of a high after taking 6 minutes off my Pendle PB, I looked at the ultra calendar for something, anything, that I could knock off early in the year to get some big miles in my legs. This essentially boiled down to a choice of two southern ultras, the Peddar’s Way in Norfolk and the Country to Capital Ultra, the latter eventually chosen as it was easier to get to and less likely to be snowed-off in the event of a ‘Beast from the East’ reprise. Once booked, I did the logical thing and promptly returned to training by both running up and down hills, and doing some road-based interval work, managing to rack up a single run in the intervening period of 20 miles (I think), but definitely getting faster over middle-distance – a core ultra skill. Funnily enough given the above, I was not 100% confident when 12 Jan 19 came around that I had the necessary miles in my legs, and upon getting to Wendover early on the Saturday morning, had distinctly mixed feelings about what was about to transpire, repeating to myself the mantra ‘be like Anna (Seeley, the only ultra-runner I know who makes it look easy),’ as this was the only way I could see myself finishing – set a pace, stick to it, don’t think about going too fast etc; essentially, run metronomically for hour after hour after hour. Oh, and stop and take whatever food and drink is on offer, whenever it is on offer. With this plan, I registered, collected my EMIT tag and number, dropped my bag at the van that would take it to the finish, used the portable loos repeatedly and then set off in the middle of the 2-300 runners down Wendover High Street hoping to get to Paddington in around 7 hours or a little less. The first mile was easy, and essentially a tour of a fairly pretty market/commuter town before mile 2 saw us hit the first, and biggest hill of the course, a pleasant walk up a wooded track, which would have been very runnable were it not for the facts that a) everyone else was walking and I was stuck b) there was still a VERY long way to go. 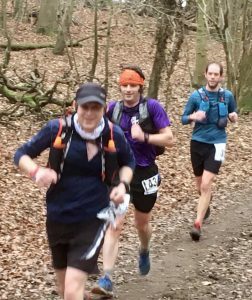 We got to the top and I started running again, keeping a pace of 8:20 – 8:50 min/miles dependent upon terrain (largely wooded/farmland and rather pleasant), with a brief dip sub-8 on a nice long road descent, and hit CP1 at Chesham, 7.7m in for water, a bit of cake and the knowledge that the leader had gone through in around 53 minutes; I was impressed, though the occupants of this outpost of Betjeman’s Metroland appeared less-so, carrying on normal Saturday morning life as a stream of runners trickled through their town centre, through a nature reserve and past youth football training, en route to CP2, Horn Hill, 17.3 miles in and again, most of it nice-if-unremarkable green countryside with the occasional village to break up the greenery. After leaving CP2 it was straight downhill through more fields to the M25, which I must confess to feeling slightly awed by, running high over it on a bridge that appears used largely by animals and tractors (judging by the underfoot matter) and feeling viscerally the speed and relentless roar of the many lanes of constant traffic underneath. Straight after crossing I actually had to apply my brain a little, as several of us became temporarily confused by the correct route out of Maple Cross, eventually finding our way down to the A41, which we hand-railed for the next mile. This loose agglomeration of half a dozen of us was to last for a few miles, taking us off the main road and up a steep wooded embankment to skirt Denham aerodrome and cross a golf course, thankfully both holes crossed having people putting rather than giving it their all with their drivers. Into Denham itself, the railway station served as a convenient landmark (we had to run under it) as well as the halfway point and, also, a marker that the fun was nearly over. One of our remaining trio (two had dropped away and one other had picked up his pace) had reconnoitred the second half of the route, running from Paddington to Denham and taking the train back, and simply said ‘welcome to the Grand Union Canal, in its’ bleak majesty. It all looks a bit like this from now on.’ He was not wrong. Before things became truly unpleasant there were highlights, however: CP3 was only a further 4-5 miles in, marking marathon distance (3:46hrs) and being equipped with water, mini-sausages and mini-beef-and-veg pasties, which hit the spot very nicely as I walked away (again, figuring that losing a bit of time was better than accidentally inhaling pastry and provoking a coughing/vomiting fit – it has been known). Food taken, I trotted on, solo now for the rest of the race as my companions were looking to run in at 9-9:30 min/miles from here, whereas I was still feeling comfortable at c.8:30 or so and knew I had one more piece of navigation to accomplish, this being taking the Paddington canal branch at a white bridge 3 miles on, with a sign pointing and saying ‘Paddington’ on it. Backing myself to manage this, I followed the water, occasionally changing sides as the towpath switched at locks, urban London starting to intrude more as the greenery beside the canal became dotted with fly-tipping and the quiet of the countryside was disturbed by the hum of concrete plants, distribution warehouses, rakes of freight wagons on lines running parallel and over and then, finally, commuter and tube trains announcing we were definitely in the capital. 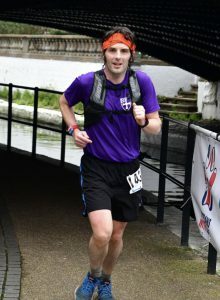 Having passed through Southall, the highlight being a bouncy floating bridge carrying the towpath past a building site, CP4 came at 33 miles, then was followed a mere 4 miles later by CP5, the organisers bunching them closer to allow for the fact that later runners would be finishing in the dark, paired after 1500hrs. I was still at a pace that felt comfortable breathing-wise through both, but was starting to slow slightly after CP5 and both feet were beginning to get rather sore; if honest, whilst the backs of factories and warehouses are of interest in some ways, this was not the scenery I’m used to and the lack of reason to change pace or watch my foot placement was strangely hypnotic, the daydreams being disturbed only by occasional cheers from passers-by, the smell of skunk at fairly regular intervals and the odd grunted hello to a competitor as I ground past them. Truthfully, even a day later I can’t remember how many people I overtook in the last 10 miles of the race, but it was a handful and all appeared to be suffering a little, with just finishing clearly being the aim. Again, all I tried to do was maintain rhythm and pace, step-by-step, mile by mile, and the repression of my earlier instincts to run faster made this possible. Finally, Little Venice arrived, the finish being hidden from view until 20 yards away by a bridge, and all the more wonderful for the surprise. EMIT handed in, confirmed that I’d managed 6:22, and was apparently 22nd overall, the winner having managed sub-5hrs. After that, tea, water, reclaim baggage and stroll to the tube with a couple of other finishers, doubtless smelling a bit ripe, before a quick wash in a pub toilet prior to getting the train back north. Thoughts? Good event, though even stripping out the fatigue effect, the first half is much nicer running than the second. Well-organised, the pleasant-seeming organisers being ex-military, which is always a plus, and serious runners themselves, with the CPs being spaced sensibly and the cut-offs neither too tight nor too likely to lead to disaster. Overall, despite this being some distance outside my comfort zone for pace, terrain or distance, I enjoyed this more than I expected. Indeed, I’d even recommend it to Anna, whose way of doing business essentially got me around, next time she wants some long-distance, canal-based fun. 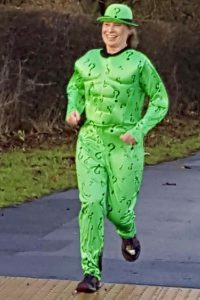 Having only joined Striders towards the back end of 2018 Sunday 13th January marked my first race in the purple and green vest. Not knowing many people and complete with my shiny new Striders hoody I arrived super-early so as not to miss the bus to Brass Monkey 2019. I’ve never really described myself as a runner, so joining a club was a big deal for me. I’d done some running prior to having my children (a couple of GNRS back in 2013 & 2014 – one of which is best never to be mentioned again and a handful of 10ks) but always seemed to find myself injured. The last 12 months have been different. Coming back from having William, I have done a lot of running. Significantly slower than I used to try to run, I have learned to love it and this led me to joining Striders and getting up at silly o’clock in October to try and get a place in Brass Monkey. Well okay – I was up anyway with an 11-month-old, but it was still very early! I was keen to have something to aim for over the winter to keep me going out when the nights were dark and cold and so was delighted to get a place. Having done the GNR 2018 in 2hr10 (including having to stop for the loo!) I knew I would likely go a little faster and the intention was to do my best but to try and relax/not worry about time. I had in mind to work towards the magical sub 2 hour half later in the year after trying to build up some speed and so decided to run the race without looking at my watch and just go by feel. I seem to not be very good at the battle inside my head during a race. I see a fast pace and spend the whole time worrying I’ll blow up – which then of course I do or I see a slow pace and spend the whole time thinking I’m not good enough. Perhaps only recently have I truly realised how much of running is mental strength. Anyway, Sunday morning was here and the weather was really very warm for January. It was certainly windy but the potential 40mph gusts didn’t worry me too much as this was about enjoying the race no matter what. Brass Monkey is a very well organised race with lovely indoor facilities and a massive Striders contingent. I certainly don’t feel like I don’t know anyone anymore! 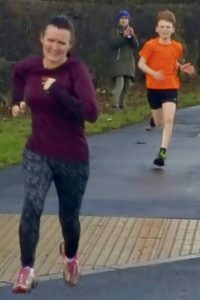 Having been chatting at the start I met another lady who was also going to run without her watch and although I knew she was quicker than me I thought I could probably stick with her for at least the first few miles, so I wasn’t on my own. The race itself is fast and flat apart from two tiny hills at the beginning, which they then take, away and double in size in time for people coming back on the return leg. The marshalls are amazing and so supportive. Harriet who I was running with said thank you to everyone and I soon started joining in this, adding to the enjoyment. I knew we had set off pretty quickly as I could see other Striders near me who I know are speedy people but I felt fine and the chat was good so was happy to keep it up for a while. My inner voice started at about mile 3 where I was worried I was holding Harriet up and encouraged her to run on. She, in turn, tried to encourage me to leave her and run on which settled my anxiety for the next few miles. A quick stop for water seemed to settle my breathing too and the next few miles flew-by still feeling strong. I did see the main clock at the halfway point and knew we were going well but didn’t give it any further thought. The second half is always harder anyway, and no matter what time you get in they give you a lovely T-Shirt. Mile 9 onwards became harder but still manageable. I had no idea what speed we were going but had a sense we must have slowed, as I was still feeling okay. The gap between us and the Striders ladies in front wasn’t growing though, so who knows. By now we were onto a very interesting discussion about veganism so there wasn’t much time to ponder it further. At about 11.5 miles Harriet fell a couple of meters behind me and encouraged me to go on. I really struggled with this as we had run so far together and I knew that the main reason I was feeling good was that of the support she had given me. I also knew though that I would have wanted her to go on if she could have and that by that point we were both clearly going to finish so I did push on and sped up a little. It was really hard work now but my training was paying off as I did still have something to give. With just under half a mile to go, I finally decided to look at my watch. I couldn’t believe the time and nearly started crying right there in the street. With the distance left it was looking pretty certain that I’d be under 2 hours. A barrier I never thought I would be able to achieve. Turning into the racecourse and hitting the worst headwind of the day wasn’t enough to stop the joy at this point and I crossed the line in 1:56:57. 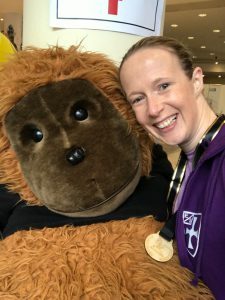 After a fairly disastrous Great North Run, I decided I needed to set myself a challenge to keep running over winter thus avoiding the seasonal crawl into a corner with a duvet and a big bar of Cadburys. 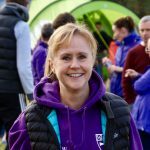 I set up the thousand miles group with the aim of running 20 miles a week from October 18 to October 19 completing an annual total of 1000 miles. I quickly fell behind as tightened Achilles and 45-year-old knees said no to a 14 mile round trip to riverside park run, I needed something different to cramming miles into the weekend. As December approached I was still behind on my target mileage. Then onto my facebook page popped «Marcothon ». 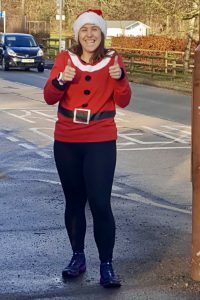 The December running streak challenge. The simplest of rules, 3 miles a day EVERY day in December. I’m not sure Marcothon is supposed to be enjoyable. Perhaps just motivating! What is it about us mad runners that we commit to these stupid challenges and don’t want to let down strangers by quitting the challenge early. Now I was no stranger to this. I had completed it 2 years ago, and it’s no mean feat. The cold, the damp the darkness and the myriad of different Christmas events and associated demands of “dad take me here, dad take me there.” The millions of microbes lining up to give you some sort of gruesome winter bug as all around you the family cough sneeze and splutter. So spurred on by the international hoards of Marcothoners on social media I set off for the dullest runs of my life. 3 boring miles around the estate every day. People call them junk miles but at least I was out! The pattern continued as I tried to run every street in Newton Hall just to give me another pointless purpose to this madness. 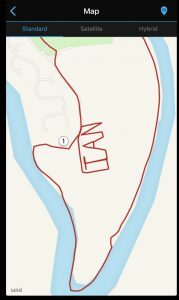 I even joined Strava; blown away by many Marcothoners attempts to draw festive patterns as their route map. I only managed a tiny Christmas tree then lost interest. By the time we reached the 23rd of December both myself and K9 companion Cookie with her associated Barkothon were still in it to win it! But then came a feat of planning as I was off to France for the Festivities with that side of my family. The morning of the 23rd was in a hotel in Kent followed by the ferry. How was I going to fit it all in? 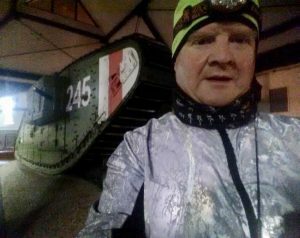 I slept in my running kit and at 5:30 am ran through the unfamiliar streets of Ashford even tangling with a World War one tank. Done! Next-stop la belle France. Whenever I’m in France training is easy. With miles of tree-lined canals and all the time in the day to run, my first five miles took me to my favourite spot. The museum of the French Resistance. I have become over the years an expert in the battles that took place between the exceptionally brave Free French resistance who took on the might of the Nazi army. Led by British trained French SAS soldiers and (Special operations executive) agents they held superior forces in place during the days around D-day to prevent the Nazis from sending their forces to the beaches. Having encountered a tank the day previously I took the opportunity to have a selfie with the Anti-tank gun that sits in the grounds of the museum. Christmas day was relatively sensible with an 8 am run around the town and back in time to play Santa. At least it was Santa as in France they have the Anti Santa Père Fouettard who only delivers the smacked bums to the naughty children. The following days consisted of fresh bread, cheese, chocolate and all the things I shouldn’t eat balanced only slightly by around 400 calories per run. As the final day approached I actually dragged my feet around the canal and associated sites taking as many photos as I could but finally finishing the final 3 miles outside the church in France where 14 years ago I was married. Done! I sprinted home knowing that was it. the appetite may sicken and so die. That strain again, it had a dying fall. O, it came o’er my legs like the sweet sound that breathes upon a bank of violets, stealing and giving odour. Enough, no more. Tis not so sweet now as it was before. The Christmas Handicap came within a whisker of being cancelled this year. 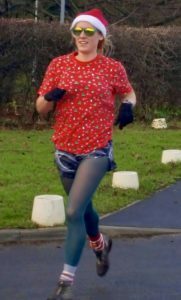 A few days before the deadline, I had only 6 entrants and quite a few apologies from people who would normally take part but were doing other races or Christmassy things. But then there was a flurry of last-minute entries and on the morning of the race, there were 34 runners, about normal for the last few years. The theme for fancy dress this year was ‘Movies past and present’ – lots of scope in that, I thought. George Nicholson and David Shipman had agreed to lead off the ‘scratch runners’ so that anybody new to the course would not get lost (more about that later!) and the various turning points and ‘hazards’ were well marked with arrows and tinsel. And so we were all set to get going at 11.00 … except that the only ‘scratch’ runner hadn’t turned up. So I had to do a quick revision of the handicapping – mostly in my head. Where’s Allan Seheult when you need him? He’d have done it in a heartbeat! So David (alias Where’s Wally and George (alias Banana Man?) 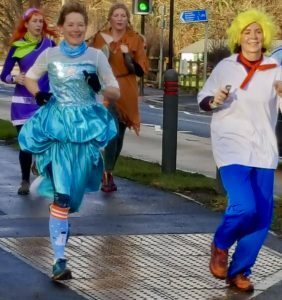 set off with the 3 new scratch runners, followed by Wendy (the Riddler) Littlewood. 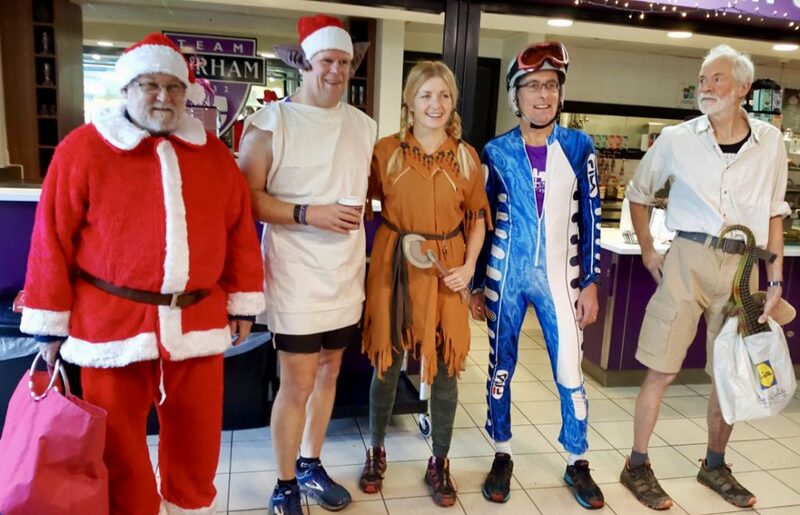 There were some amazing costumes including Captain America, Crocodile Dundee, a nun, a busy-bee and Conrad who seemed to be a downhill racer! It was a good day for running – not too cold, sunny and the only bit of ice was on part of the footpath and on the corner at Houghall Lane. Everyone entered into the spirit of it – the bran tub was overflowing and Santa entertained passers-by as usual. The first across the finish line was Fiona Harrington Hughes in 47 minutes. Fastest male was Bryan Potts in 32:07, the fastest female was Fiona Brennan in 34:56. All 3 juniors got prizes – the fastest being Lewis Littlewood in 41:01. The rest of the prizes were for fancy dress. And then we come to the last across the finish line … we waited but there was no sign. 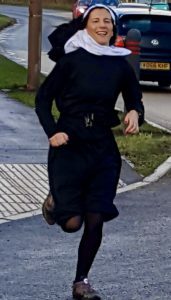 And then someone said ‘Is that not him running down from Shincliffe Bank?’. Completely from the wrong direction! He had just kept going past Houghall Lane in spite of the large arrow and tinsel directing runners to turn right. Obviously ‘in the zone’! Anyway, he saw the funny side of it. Afterwards, we went to the Court Inn for the Christmas Carvery and the prize giving. Fancy Dress prizes went to (in no particular order) Lizzy Wallace, Conrad White, Mike Bennett, Anna Mason, George Nicholson, Lesley Charman, David Shipman, Wendy Littlewood, Tim Matthews, Lesley Hamill, Karen Byng, Fiona Kinghorn Jones, Joanne Richardson, Sam Renwick, Jonathan Hamill and Fiona Brannan. Once again it was a very enjoyable and sociable event. More Photo’s can be found here. A straightforward out and back again fell race starting from Kirby Stephen marketplace. Unusually warm, dry and sunny conditions meant this was a very runnable race. I’ve had a gentle few months in terms of training, an injury picked up in early November, not helped by a fall in the Wooler Marathon (two months later, the bruising is still there and hurting!). Cross-country proved doable, but running in, or walking in the fells was impossible for a few months, as I could go up fine – but not down! After a rather sedentary week in Somerset for Christmas, and a number of get-togethers and office parties in the weeks before, the short and not horrendously steep Guisborough Woods race was a good way to get back into fell races, if not actually onto the top of any fells. 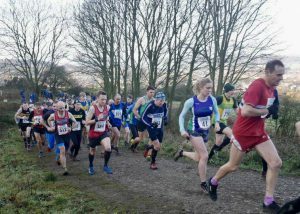 It is a course of 3 laps around the quarry in Guisborough woods, each lap with around 130m of climb and descent – so after the first, you know exactly what you have to do again, and again… In terms of distance, it is close to cross-country, but requires rather more effort – a worthwhile training exercise for both the up and downhills! 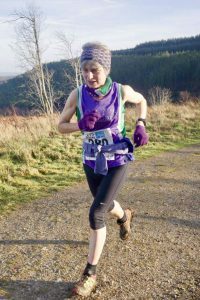 It might not be the most scenic of fell races – it’s not a bad view, you just see the same one three times – but is a marked, marshalled course with no exposed summits or kit requirements (on the day I did it – in bad weather this would likely change!) so a good options for anyone off work and looking for something to do between Christmas and New Year (there are junior races too). The lapped course may not be the most exciting, but it does mean that no runner is ever far from the start or help if needed. A bumper turnout of around 200 runners showed lots had this idea! My time off and reduced training definitely showed, I was significantly slower and in more discomfort in the climbs than usual, but made it round all the same being beaten by sometime Strider Danny Lim – that hasn’t happened before! Well done Danny, I’ll need to work harder next time… At least the weather was kind and sunny, and my knee didn’t show any signs of pain on the descent, which meant I was able to claw back some time and places careering down through the mud, nearly taking out a poor man from DFR on one lap (running down steep mud is easy – stopping quickly is not!). Not long after I finished, Mike Bennett ran in, soon followed by Nina, arms out and clearly enjoying flying down the hill for a final time. We lined up along the finish to cheer Jan in, the final of our ladies team (we came 3rd!) as she let us all know that she had managed to stay on her feet this time, no broken bones! A trundle back to base at the Rugby Club for the prize giving – including winter series winners from last year, the year before, top 3 male and female finishers in this years race, veteran finishers, junior prizes – I kept asking Nina what the current prize was for, eventually we both lost count – Esk Valley are very generous with their prizes! 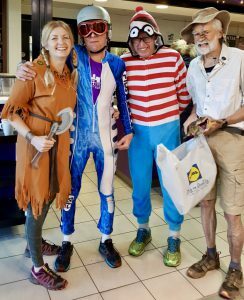 A final shout of ‘anyone who hasn’t got a prize, and thinks they should have – come and see me!’ and time to go home and wash the mud (and in Nina’s case – blood) off our legs and rest up ready for the Captain Cooks NYD race.